Nyassa Navidzadeh, a psychiatrist from Montreal, Canada, spent several months overseas, providing aid to the victims of the Ebola outbreak. Based in Foya, Liberia, she worked as a Mental Health Officer for Doctors Without Borders. She saw individuals and families suffering from the illness become ostracized by the community, adding to the stress they were already under. Navidzadeh met with the Trauma and Mental Health Report to discuss her experience in Liberia, treating Ebola patients, families, and relief workers. Navidzadeh: In Liberia, my role was to evaluate the mental health needs of patients and their families and provide them with mental health support. We tried to provide psychosocial support to those affected by Ebola by addressing their worries, and helping them cope throughout the various stages of the illness. Navidzadeh also provided support to the staff in Liberia who saw death on a daily basis. A group called the outreach team was responsible for bringing patients to the treatment center. 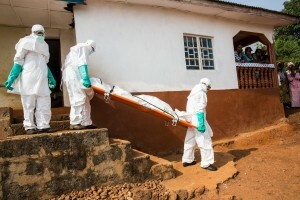 They would travel to the houses of individuals who had died from Ebola and work with the hygienist team to disinfect dead bodies and the affected areas. Navidzadeh: The most psychological trauma was experienced by the burial, outreach and hygienist teams because they were constantly surrounded by death. They were at a higher risk for developing anxiety. For some, accompanying the family to the burial site was too difficult for them – especially for the national staff whose family members had also passed away from the virus. 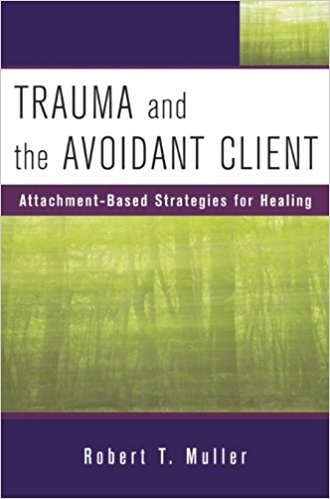 Their ability to cope depended on their personalities and what they had experienced before. It may have been especially difficult for someone who had never seen a dead body. 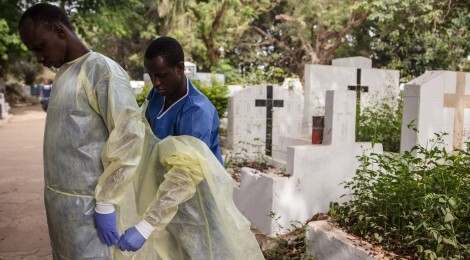 Those exposed to dying Ebola patients or the disinfecting and burying process exhibited many serious emotional symptoms. Navidzadeh: Some staff began showing some symptoms of post-traumatic stress disorder. They were having difficulty sleeping and they experienced nightmares and restless sleeping patterns — some would wake in the middle of the night, sweating. They also experienced anxiety and irritability, even during the day. They were tired and their mood was a bit lower. 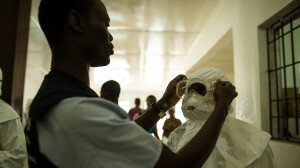 There was always a fear and risk of contracting the Ebola virus. The medical equipment was routinely disinfected, but sometimes, a staff member would contract the illness. Navidzadeh: There is a great range of effects and reactions. The main reaction would be extreme anxiety from the fear of the unknown and the fear of death. There was denial and anger about having contracted the virus. The national staff worried about being rejected by their own families and communities. Navidzadeh recalls a time when a medical staff member contracted Ebola. Navidzadeh: In Guinea, a male national staff member that was infected had a sister that worked in the hospital as well. They were on the same Health Promotion team. The sister was very sad and had a lot of depressive symptoms. She was also concerned because if her brother passed away, she would have been the last one left in her family. She didn’t know whether she was going to make enough money to support herself and whether she was going to be rejected by the rest of the community. Contracting the illness also created a strained workplace environment, adding to the trauma felt by the infected person. Navidzadeh: There was a range of emotions [when a staff member caught the virus]. Some staff members were angry that they weren’t following the protocols properly, and were putting everyone else at risk. Others were very sad and empathic towards their colleagues. As a mental health officer, one of Navidzadeh’s roles was to provide counseling and support to the staff. Other resources were also put into place to limit the psychological impact on the relief workers. Navidzadeh: There was an emergency psychological support team, available by phone and Internet, 24 hours a day, based at the operational center in Europe. This mental health support team could also fly to the crisis area, if need be. Some were encouraged to take days off, if they needed to. They also had team support which provided futher opportunity to talk about what they were going through. While a challenging and risky job, many people with diverse professional backgrounds continue to offer their services overseas. For Navidzadeh and many others, it was a rewarding experience. Navidzadeh: Getting immersed in the various cultures and ways of life and inevitably having to adapt to them has helped me broaden my view on life. It has also helped me learn to cope with different stressful situations. When I look back at my childhood and at what my parents were able to give me, I feel very fortunate. Unfortunately, not everyone in the world is given equal opportunity at life. Was I scared? I cannot deny that fear did creep up now and then, but keeping the objective of helping others in sight, helped me to move forward.